Frederick M. Brown/GettyTony Robbins gives a presentation in 2010. 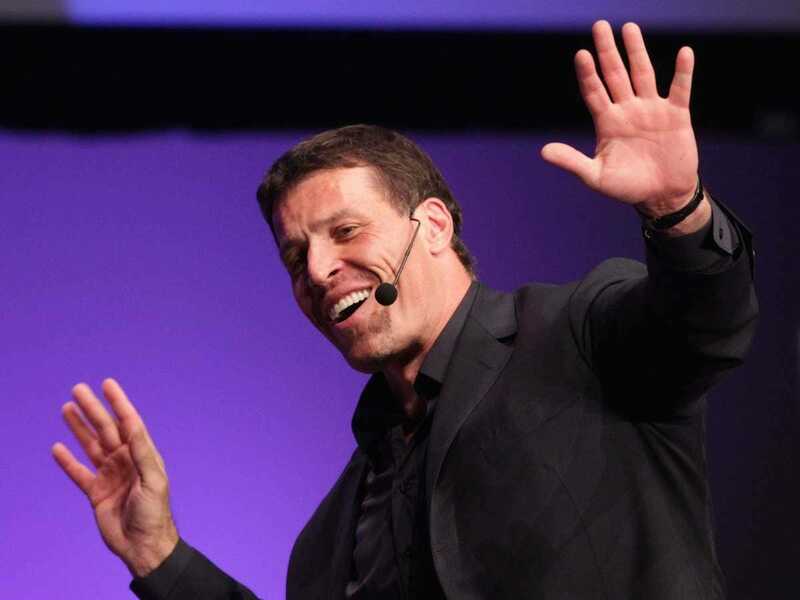 Love or hate him, there’s no denying that celebrity life coach Tony Robbins is an incredibly engaging public speaker. For the past 30 years, people have paid hundreds, and sometimes thousands, of dollars each to attend one of Robbins’ high-energy seminars. In addition to personally coaching powerful people like investing legend Paul Tudor Jones and President Bill Clinton, celebrities can often be found in his audience. Oprah Winfrey said that Robbins’ Unleash the Power Within event was “one of the most incredible experiences” of her life, and Al Gore was in the front row of Robbins’ “Why we do what we do” TED Talk, which has now been viewed over 20 million times online. 1. Know and respect your audience. “That might sound basic and corny, but I don’t see it that way. I want to know, just like when I work with an individual, what do they desire, what do they hate, what do they love, what are they hungry for, what’s missing?” Robbins says. “Because the more you understand what somebody wants, needs, and fears, the more you can figure out how to add value. I do my homework about the company, individuals in the company, leaders in the company, so I dig in. I interview people. I have a team of people who do homework for me, as well,” he says. 2. Add more value than anyone expects. Robbins says that in order to leave a lasting impression on your audience, you need to surprise them by going deeper than they predicted. The key to doing this, he says, is by truly caring about what you’re saying. 3. Tap your audience’s emotions. “We’ve all been put to sleep by somebody who’s told us all these wonderful facts that didn’t matter because information without emotion is not retained,” Robbins says. A great presenter draws you in and takes you outside of yourself. That’s why you need to transport the audience. And the way to move an audience is by becoming moved yourself, which can only happen if you’re being genuine.